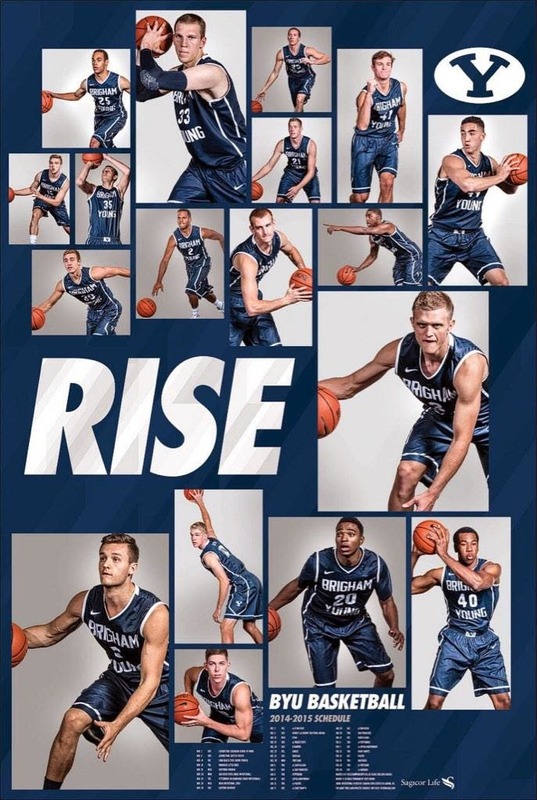 The new BYU Hoops poster! Love it. I'm tired of football. Let's talk about BASKETBALL! Next Wednesday is the Cougar Tipoff, and I couldn't be more excited! Merry Christmas to me! Matt Carlino transferred to Marquette & Eric Mika went on a mission. I hate to say it, but Matty is the Jake Heaps of the basketball team. I hope he finds what he's looking for in Wisconsin, but it was an incredibly selfish move to make, IMO. I don't think he'll find a system that was willing to make such drastic accommodations to make him a better basketball player as BYU. He just wasn't willing to admit it. The only other player we lost from last year's roster is Eric Mika, who is now Elder Mika in Rome, Italy. We got a zillion new players. There are now 18 guys on the roster. EIGHTEEN. And 17 of them are eligible to play this year (Kyle Davis must redshirt, a la transfer rules. However, he shall be blessed from coming into the light from the darkness up in Logan, I am sure). Notables include Corbin Kaufusi, who shall strike fear into the hearts of Gonzaga players as another former football-playing beast of a man wearing #44, Chase Fisher, who is finally eligible to play after transferring from Wake Forest, and some freshmen I've heard really good things about-- Dalton Nixon, Jake Toolson, Ryan Andrus, Jordan Chatman, & Isaac Neilson. I'd be surprised if a few of them didn't redshirt, though. There's just so many boys on this team! I love the depth, especially in the post. That's gonna be a HUGE relief compared to last year's woes. Tyler Haws is projected to be the nation's top scorer by Sports Illustrated. BOOM. Everyone chant with me now: please don't get hurt, please don't get hurt, please don't get hurt... Sorry, Taysom's made me paranoid! If Tyler stays healthy this year, I predict some Jimmer-esque Hawesomeness. Fingers crossed. KC is BACK! I bet if that kid got a nickel for every time he was asked how his knee is doing this summer, he'd probably be making an NBA salary. Every time I've heard him asked that question, he says it's doing great. He's been cleared medically and should be ready to ball when Long Beach State comes to town. (And yes, that is me in the video at 10:10). Also, he's definitely bulked up his arms as promised. Dang. #Don'tJudge. Oh, and also, he saved a woman who was drowning in the ocean in Hawaii. Busy summer for Kyle! Jimmer got signed by the Pelicans. Speaking of Jimmer, he's on a new team in NOLA, and I think he's got the best chance he's had so far in the NBA. He's doing well in pre-season play and is currently fighting for the backup PG spot. Go Jimmer! So excited to see him finally succeed, which I know he will if he's given the chance. Nick Emery came back from his mission, had surgery, then went back on his mission. Apparently he has some disorder called Thoracic Outlet Syndrome, which causes pain in the neck & shoulders. Rumors were flying about whether he would stay and try to play this year, but he ended up going back to Germany to finish up his mission. He should be back ready to play at the regularly scheduled time. Boom Shakalaka Part Deux. I thought this event was a little lacking in creativity and entertainment compared to last year, but it definitely had its moments. I thought Corbin Kaufusi's football-inspired dunk, followed by bowling his roommates down with the ball was pretty funny. I also liked the slightly inappropriate moment when Josh Sharp held up his new baby daughter and then commented that last year's kiss with his wife after jumping over her to dunk was so great that they got a baby out of it. haha! He always looks so bored and disinterested with everything, but he's definitely got an attitude and sense of humor hiding under that calm exterior. Let's play HOOPS! So excited!